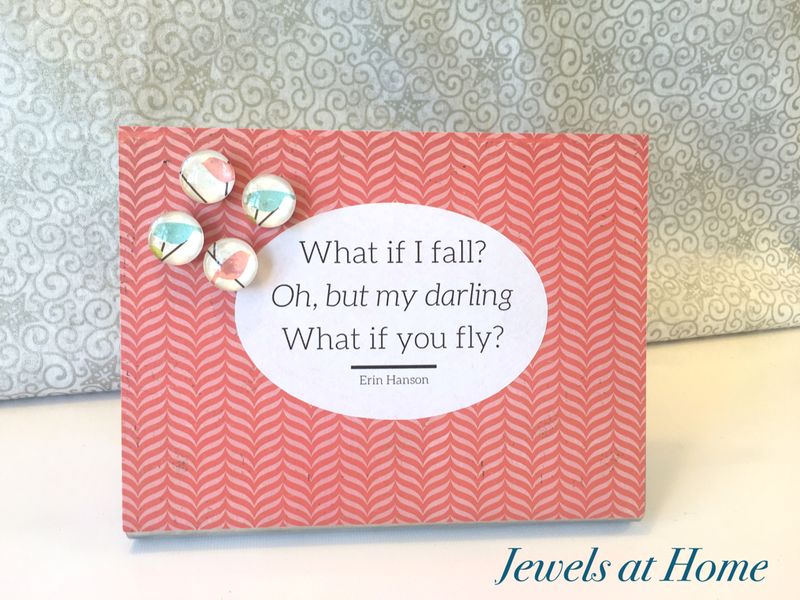 Most years, I try to make something creative as holiday gifts for our teachers and coworkers. 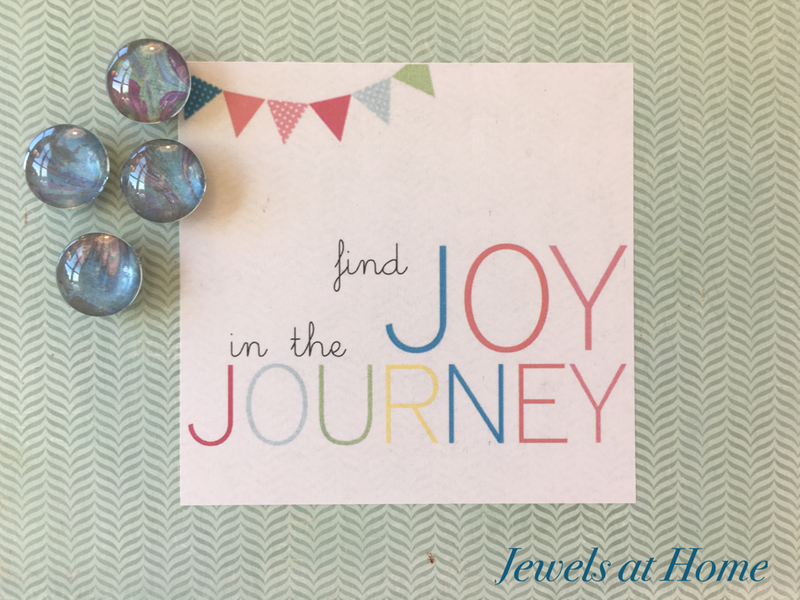 There’s so much joy in giving, but we’re also living in a time and place where it feels like everything is at your fingertips, so something handmade feels like a good way to express how much we appreciate those around us. When I can manage it, I make a few extra to last through the year as hostess and grown-up birthday gifts. I’ve linked to previous years’ handmade gifts at the bottom of the post, if you’re looking for more ideas. This year, I decided to make stenciled canvas tote bags as our holiday treat. They’re so pretty and unique, yet also practical, as we’re trying to minimize our use of disposable shopping bags. 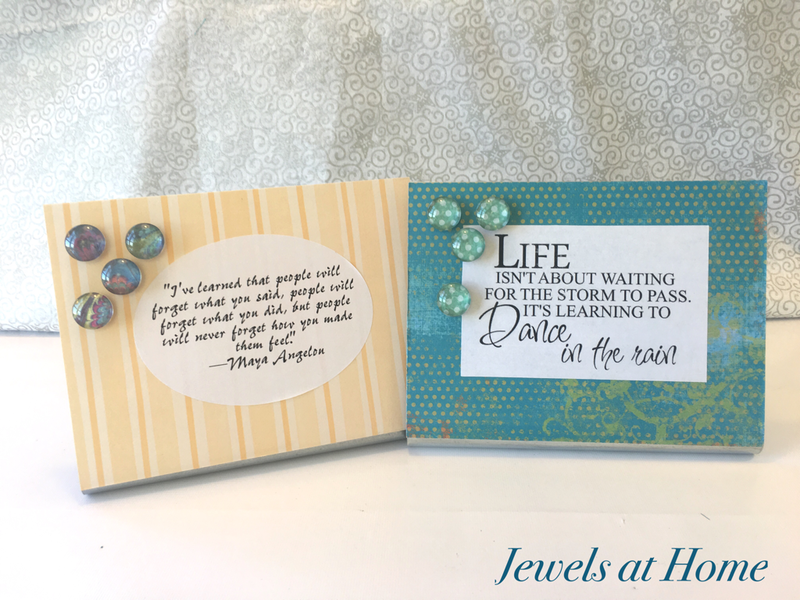 I had so much fun trying different combinations of colors and patterns. That’s all! Unless you’re me and repeat it many, many times! Here are just some of the combinations I made! Feathers,with a contrasting accent color or (bottom) ombré blues and greys. I really liked the feathers! I loved the tile in this mix of copper and gold paint. The metallic paints were very thick and made very crisp designs. The birds were fun to arrange in different patterns and colors. And I got to keep this one for myself! No matter how I plan, the holidays are hectic. I definitely all felt worthwhile when I went to give out the bags. Our teachers and friends were so excited – it definitely put me in the spirit of the season! 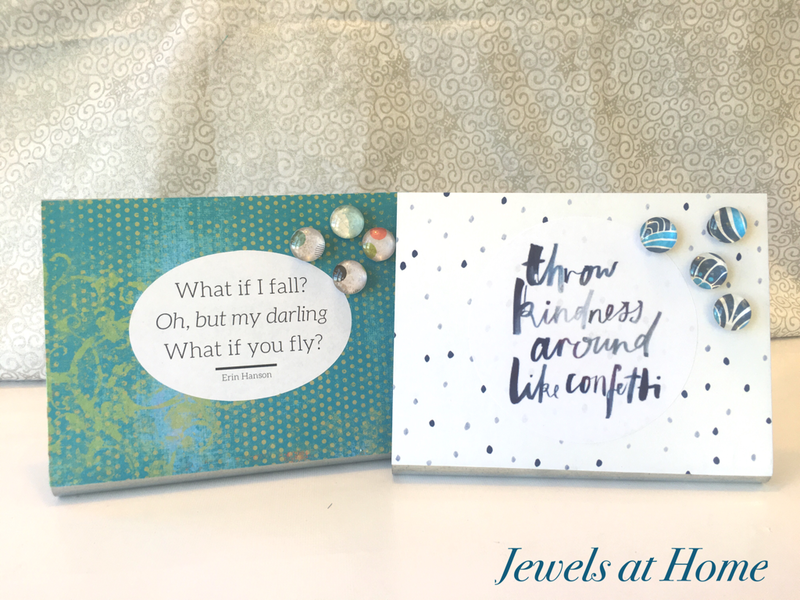 This year’s holiday gifts for our teachers and friends are these desktop magnet boards with coordinating glass cabochon magnets. 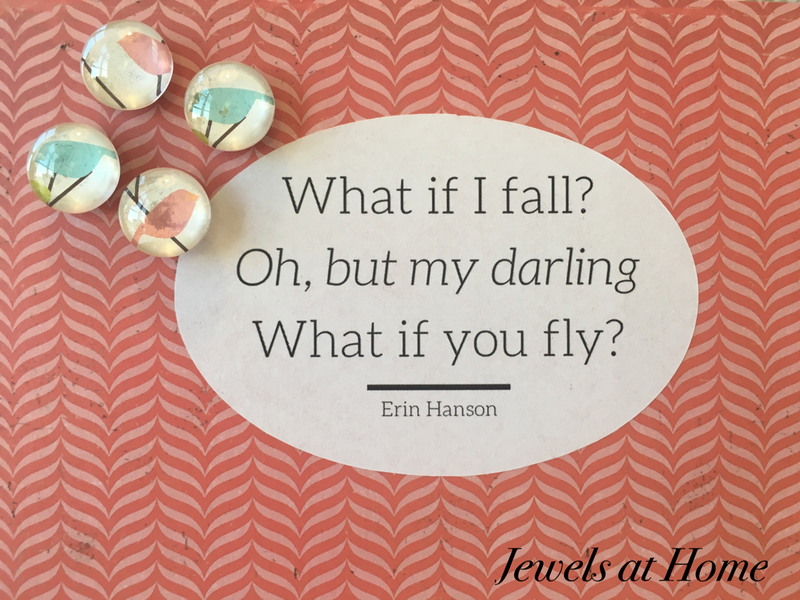 I love seeing all the colors and patterns come together with the inspirational quotes. You can find the supply list and instructions in the first post. 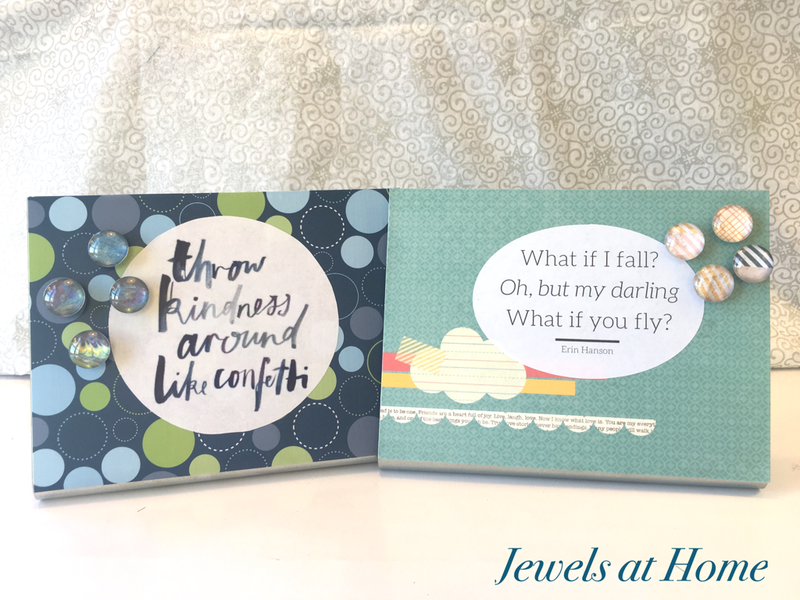 There are so many ways to combine the papers and quotes that I wanted to show you some more in this post! 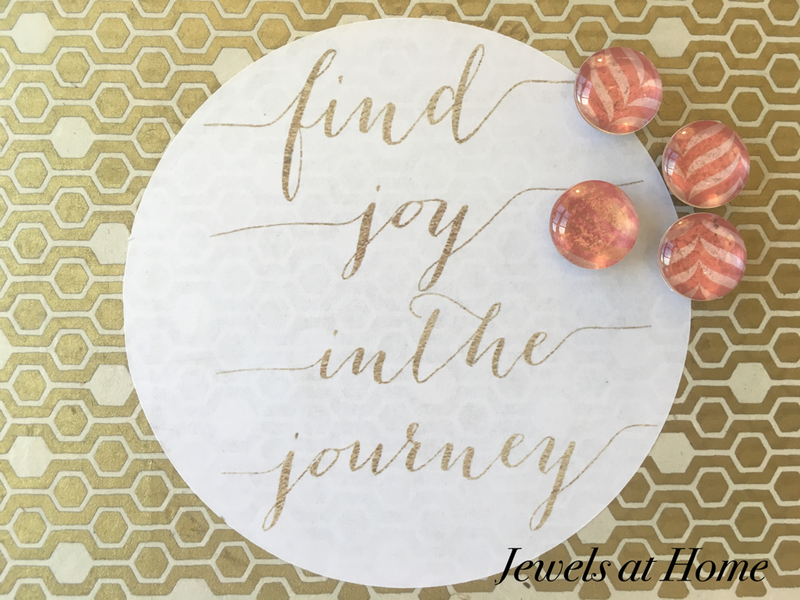 Hope you are settling into a lovely holiday season! 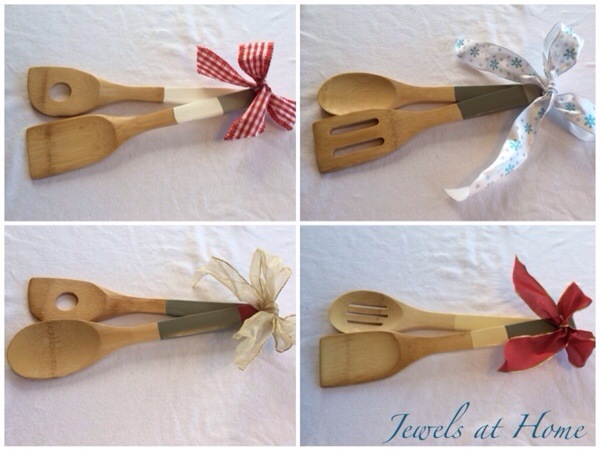 I recently posted about the hand-painted Bamboo Cooking Utensils we are giving the boys’ teachers this year. To make the gifts even more personalized, I am including recipe cards with the boys’ favorite recipes. Each of the boys chose a recipe from our home that he loves. I originally asked them to write out the recipes on cards, but it turned out that it was hard to fit the recipes onto the cards, so I ended up typing the recipes, but I included their hand-written titles. I also added this cute mixing bowl clipart. 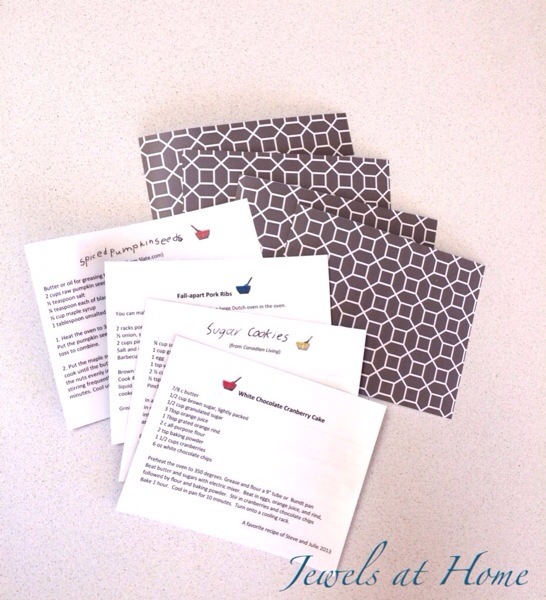 I fit four recipes onto a 8.5″x11″ template, and I printed them out on heavy cardstock. 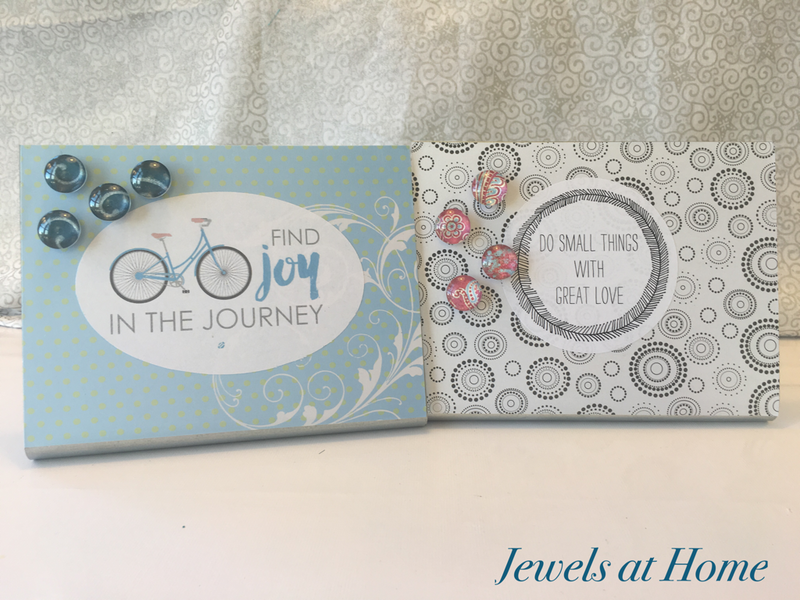 To decorate and laminate the cards, I used a patterned contact paper (Marise Charcoal by Laura Ashley) on the back and a clear contact paper on the front. I laid the full sheets of recipes onto the contact paper before cutting them out, and it went pretty smoothly (literally and figuratively). Finally, I punched a hole in the corner of each set of cards and used a ribbon to tie them onto the spoons. Reminder: here are the painted kitchen utensils. 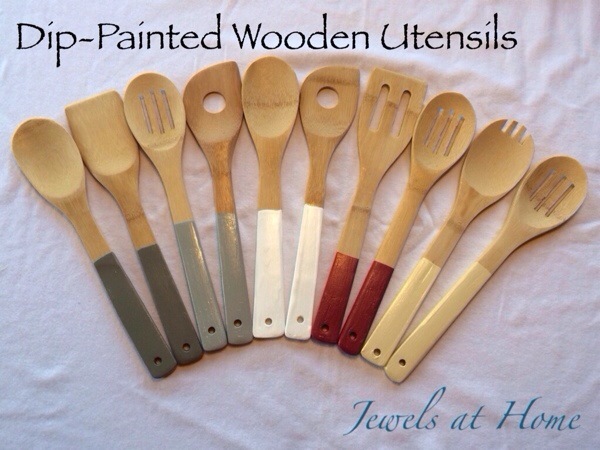 I love how they look, though my tip would be to not paint as far up the handle, so the utensils can be used for all kinds of cooking and prep. 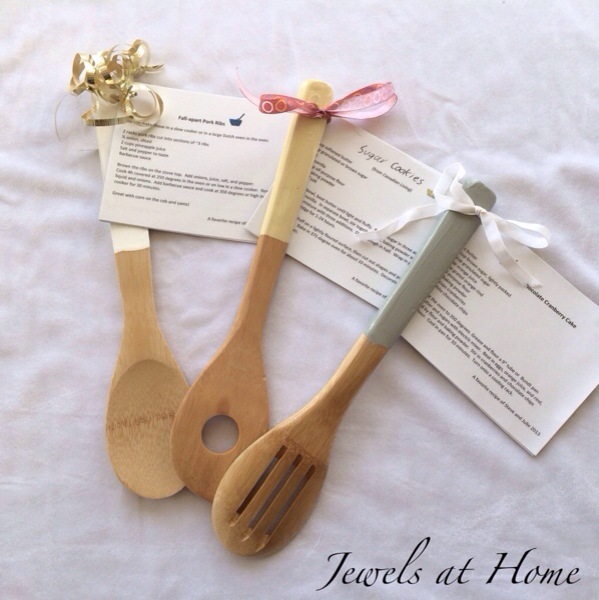 And here are our finished gifts: painted utensils with our personalized recipe cards attached. It can’t be said often enough how hard-working and dedicated our teachers are. We played Santa and ran around the boys’ schools giving these out today, and I hope that our gifts show our teachers how much we appreciate all they do. And as I mentioned, before, I’m glad this year’s gifts were a lot lighter to carry around school than last year’s pancake and hot chocolate mixes in glass jars! I’m bringing a wagon if I do those again next year! I’m sure you’ve noticed that dip painting is very popular these days. I’m not sure that I like the look on everything, but some of those dip-painting projects do look really great. For holiday gifts this year, I decided to make some fun dip-painted kitchen utensils. 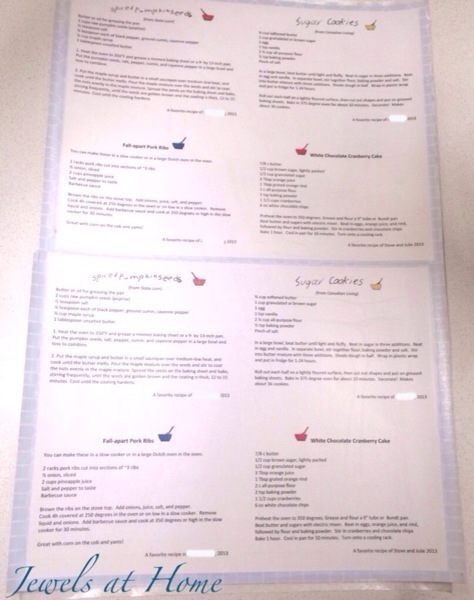 I’m going to add some recipe cards hand-written by the kids to make special gifts to give their teachers. 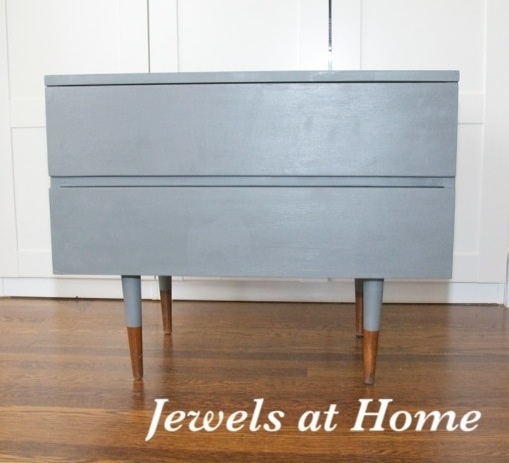 And a while back, I used a reverse dip-painted look when I repainted a mid-century nightstand for the boys’ room. Wooden or bamboo utensils. These Oceanstar Bamboo Cooking Utensils worked very well, with their flat finish and a broad handle to show off the paint. With three kids, there are a lot of teachers in our lives, so I set up a dip painting center in our backyard. 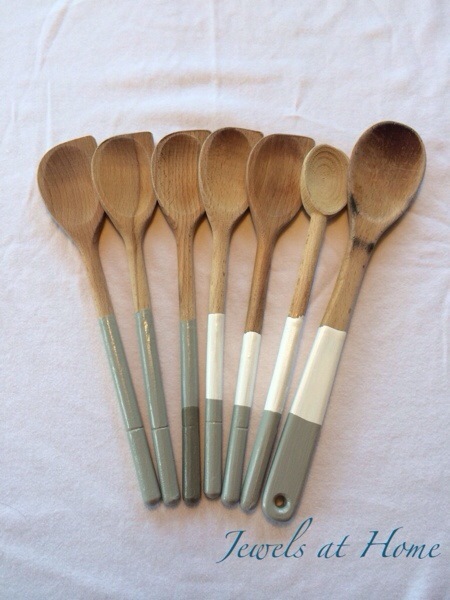 I dipped the handles of the utensils in a variety of paint leftover from other projects. For some, I partially dipped in a second color. Finally, I added two coats of clear polyurethane. 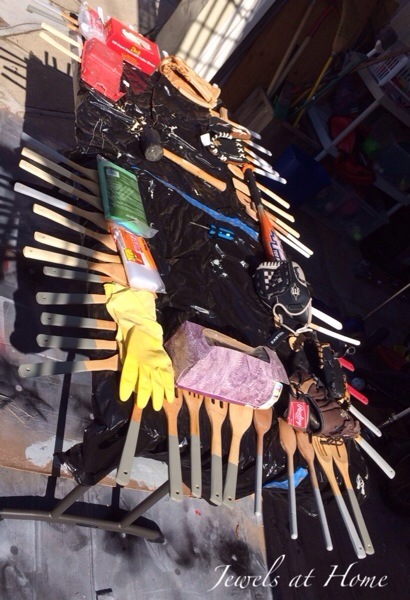 Between coats, I laid the utensils with the painted edge hanging off of the work table. The cardboard under the table caught any drips. I did use a brush and sandpaper to touch up occasionally, but for the most part, the paint went on quite smoothly and easily. One small modification that I would recommend is to not paint too far up on the handle. The way I did it would be fine for stirring things in a pan, but hubby, who cooks a lot more than I do, pointed out that the painted handles would be harder to use when stirring a big pot of soup or stew. 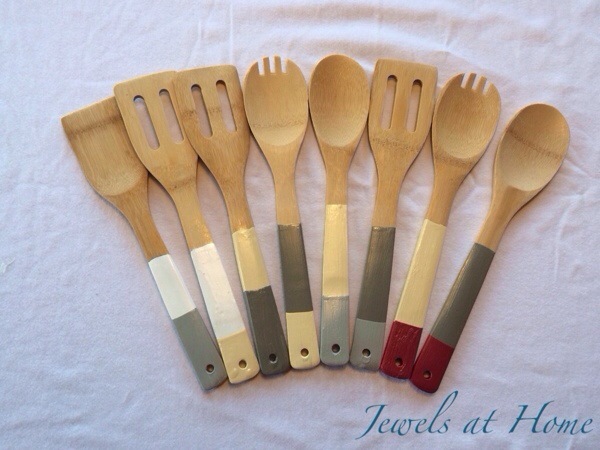 I started with one color of paint on the handles of the utensils. For some of the utensils, I added a second color of paint. So many options! These are the utensils from our kitchen. Hubby pointed out that it would be better to have painted just the very tips of the handles, so the paint doesn’t get into big pots of soup, etc.. I guess I owe him some new utensils for Christmas. 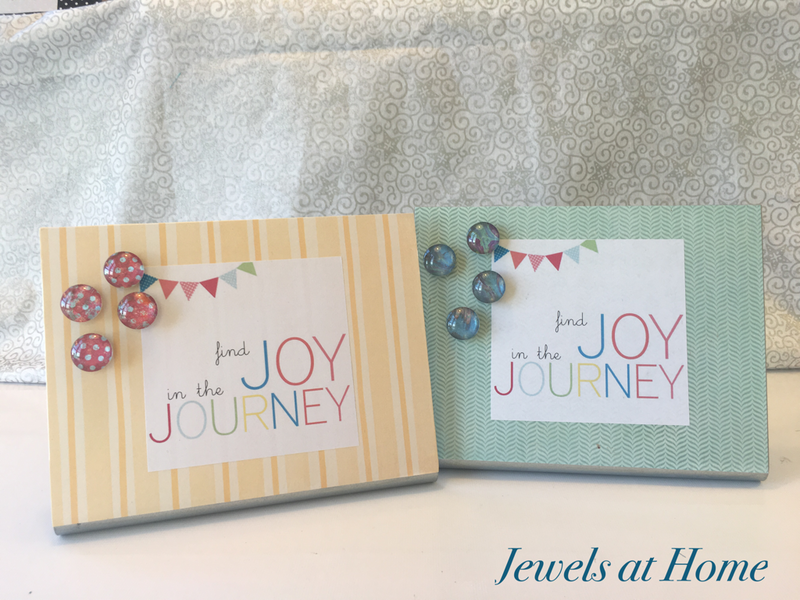 You can mix and match colors and patterns to make great-looking sets to give as gifts. To make our gifts more personalized, I asked each boy to pick a favorite recipe and write it out by hand. 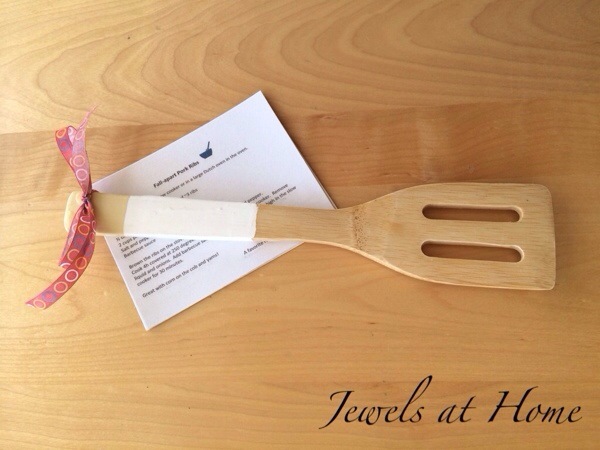 I’m going to copy the recipes and tie them to the handle of the utensils with ribbon. I love all the variations, and I hope each of our teachers will find a choice that’s perfect for her or him. 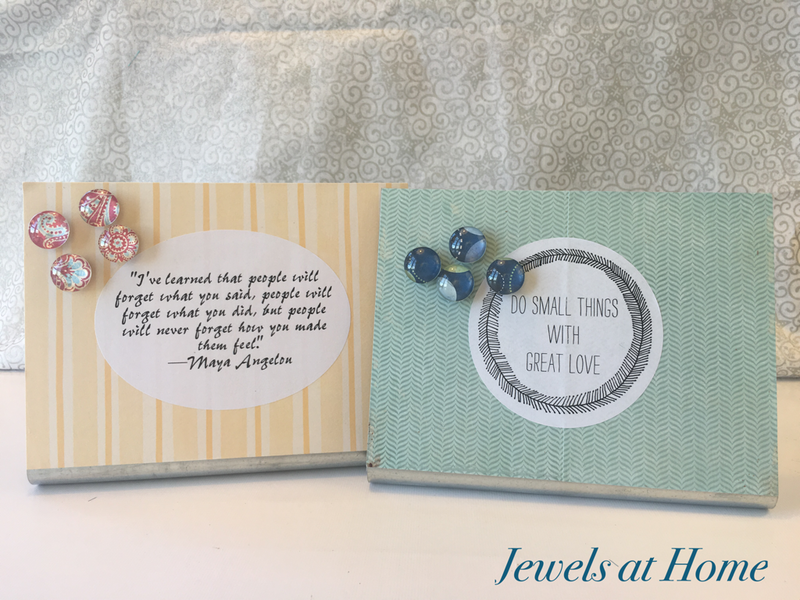 Teachers’ gifts. 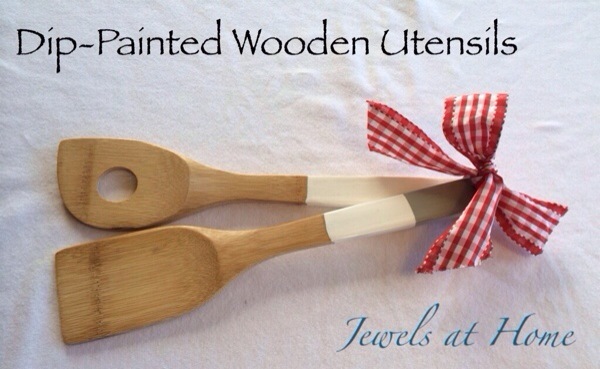 Dip-painted wooden utensils with your child’s favorite recipes on cards. 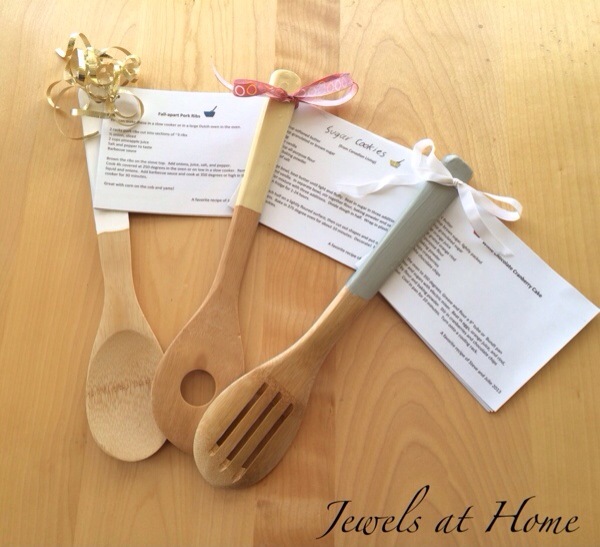 I’m looking forward to sharing our gifts with the wonderful teachers in our lives, and I’m also glad these wooden utensils will be a lot lighter to carry around school than last year’s pancake and hot chocolate mixes in glass jars!